Jeff Kagan and Paige Doughty are likely not one of the more well-known names in the world of children’s music. Interestingly enough the husband and wife duo is nothing new to that realm. Kagan has two solo albums. And the pair together has released two full length studio recordings, all of which have been released without the help of any of the major kindie rock labels out there. And the couple hasn’t stopped there. Last Friday, the duo released its third full-length studio recording Mighty Wolf. Named apparently after the couple’s infant son, Mighty Wolf continues the couple’s long-running tradition of mixing that musical and educational content that it has used in each of its previous recordings. This includes Kagan’s own solo recordings. Even within the context of the album’s musical content, Kagan and Doughty don’t even to one style. That is just one way in which this latest recording stands out. The previously mentioned lyrical content is another important element to consider in this album. Just as the couple mixes things up with the album’s musical content, so does it do with the album’s lyrical content, too. There is a lesson about ecology and a much larger elementary level biology lesson spread across the album’s twenty-three total tracks. Speaking of those tracks, the album’s sequenncing rounds out its most notable elements. While Mighty Wolf consists of twenty-three total tracks, only about half of the presented tracks are actually songs. The other thirteen tracks are set-ups for the the featured songs. The sequencing of all twenty-three songs maintains the album’s fluidity and in turn will keep parents, educators, and children alike fully engaged. That is not to say that the album’s musical and lyrical content won’t keep listeners engaged. As a matter of fact, both elements partnered with the album’s sequencing make the album in whole just as much of a good introduction to Jeff and Paige for new audiences as it is a re-introduction to the couple for those that are more familiar with the pair’s body of work. Jeff and Paige’s latest full-length studio recording is a good re-introduction for those that are familiar with the couple’s music. For those that might not be so familiar with the duo’s music on the other hand, it is just as good of an introduction. That is because its mix of musical and lyrical content is similar to that of its previous recordings. The musical content displayed in this record is especially worth the note because on that more macro level, the duo even mixes up the sounds exhibited throughout the course of the record. Early on in the album’s run, Kagan and Doughty present a light kindie rock/pop sound in ‘Triple Rainbow.’ This song isn’t the only instance in which that sound is exhibited. ‘Black Widow,’ ‘Beaver,’ and ‘Dead and Delicious’ each have their own original kindie rock/pop sound that stands out from the other noted songs. ‘Dead and Delicious’ offers something of a blues-influenced sound while ‘Beaver’ has more of a light rock influence a la Dave Matthews Band and others of that ilk. ‘Triple Rainbow’ on the other hand has more of a pure acoustic rock sound. These are just a few of the album’s songs that boast a rock sound. ‘Lightning’ also boasts its own kindie rock sound. As if that isn’t enough for listeners, Kagan and Doughty don’t stick to just a variety of kindie rock sounds throughout their new record. There are also Country/Americana variants presented throughout other featured tracks. Those tracks include: ‘Grandma Gatewood,’ ‘That’s Not The Way,’ ‘Aphid Banquet For Two’ and the album’s closer ‘The Great Monarch Migration.’ The couple even included a poppy sound in ‘The Arctic’s Freezing’ and ‘Ungulate.’ The fact that this album boasts such a myriad of musical stylings from beginning to end (and that there are no defined parameters in the transition from one genre to another) is a big plus for the album in whole. It is just one part of what makes this record worth hearing regardless of listeners’ familiarity with Jeff and Paige. The different lyrical topics (and the topics within those topics) adds even more interest to the album. 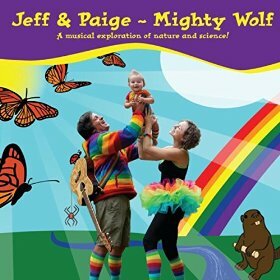 The various styles of music that are presented throughout the course of Jeff and Paige’s new album are in themselves plenty of reason for listeners to hear the couple’s latest full-length studio recording. While that content is important to the album’s overall presentation in its own right, it is just one part of what makes the album worth the listen. The mix of topics presented in the album’s lyrical content (and the topics contained within those topics) plays an equally important role in the album’s presentation. The central topics in question are topics of biology and ecology. This is nothing new for Jeff and Paige. However the topics that lie within those topics are what really make the picture painted by the album’s lyrical content whole. The biology lesson contained within the album’s songs centers on different animals of the world and their importance to their respective ecosystems. ‘Black Widow’ and ‘Dead and Delicious’ dispel the myths and stereotypes of spiders and certain birds. In the case of ‘Dead and Delicious’ the bird in question is a raven. It is interesting that Jeff and Paige would go with a raven versus a vulture considering the negative reputation that surrounds vultures. The reality of vultures is that just like ravens, they are basically nature’s garbage men, too. They help clear away road kill, and other dead animals by scavenging. That is not to say that they shouldn’t have gone with a raven. A raven is a good choice. It is just a surprise that the duo opted for a less familiar reference. ‘Beaver’ explains through song the important role that beavers play in building their dams while ‘The Great Monarch Migration’ and ‘the Arctic’s Freezing’ are more general. The prior discusses the life span of monarch butterflies while the latter discusses everyday life for animals in the Arctic. The lesson about biology and biodiversity is just one of the lessons presented in this album. There is also a lesson about ecology presented in ‘Grandma Gatewood’ and ‘That’s Not The Way.’ ‘Grandma Gatewood’ presents the lesson about ecology and preservation through a story about the real life figure Emma Rowena Gatewood. Gatewood is famous for being the first woman to have hiked the entire Appalachian Trail (that is 2,168 miles) by herself and in one season, too. The song tells of her great deed and at the same time celebrates the beauty of the Appalachian Trail. Essentially it emphasizes the need to protect it (and in a larger picture, nature in whole) for the next generation that might want to try to accomplish her feat. On a different note, ‘That’s Not The Way’ discusses the interweaving roles that man and nature play on one another each day. It is a relatively broad topic. But the duo pulls it off quite well here. Together with the lessons on biology and biodiversity, the lessons centered on ecology and nature preservation show in whole why the varied lyrical topics presented throughout this album are just as important to the record’s whole as its varied musical styles. The two elements together give listeners new and old alike plenty of reason to hear Jeff and Paige’s new record. They are just part of the reason that listeners will want to hear Mighty Wolf. The album’s sequencing rounds out the reasons that the album proves itself worth the listen. The musical and lyrical content that make up the body of Mighty Wolf makes the record an ahem* mighty collection of songs. While both elements together play an important role in the success of this record, they are only a portion of what helps it live up to its title. The album’s sequencing rounds out the ways in which it proves itself to be a strong new effort from the independent children’s entertainers. As previously noted, not all of the tracks featured in this record are musical compositions. Roughly half of its twenty-three total songs are musical numbers. The other tracks are little skits that Jeff and Paige use to introduce each song. On the surface this may not seem like much. However, the sequencing of the musical and non-musical tracks together is more important to th record’s overall presentation than one might think. The introductions serve a double purpose. Their primary purpose is to serve as an introduction to each lesson. The secondary purpose of each non-musical track is as a breather of sorts between songs. They help to break things up as the album progresses. The end result is an increased chance of keeping listeners engaged. It is a smart approach to keeping the album’s pacing solid. That solid pacing combined with the album’s equally engaging musical and lyrical content makes Mighty Wolf a truly mighty new release and an equally mighty independent release for the children’s entertainers. In 1903, Norwegian explorer Roald Amundsen set out with a small expedition to traverse the legendary and dangerous Northwest Passage. That is the Arctic waterway that connects the North Atlantic and North Pacific Ocean well above Canada in the country’s Arctic Archipelago. It took Amundsen and company three years to navigate the deadly waterway. But in 1906 they accomplished the task and broke new ground for mariners the world over. While his achievement was a landmark, it wasn’t the first time that anyone had tried to make their way through the cold, icy waters of the Northwest Passage. Nearly six decades earlier British explorer and Captain in the British Royal Navy Sir John Franklin set off with 128 men to try and make their way through the waterway. Needless to say that voyage has since gone on to become known as one of the worst tragedies in naval history. Now thanks to PBS and PBS Distribution audiences get a whole new look at Franklin’s doomed expedition in a new episode of PBS’ hit science-based series NOVA. The special, which is available now on DVD, is yet another example of why PBS is the last bastion of truly worthwhile programming on television today. The very story at the heart of this episode is the crux of the program’s presentation. It isn’t an unknown story. However, it is not exactly often taught in history classes at any level. So having it presented here makes it an important presentation in its own right. The manner in which the story was presented in this episode is another important part of the episode’s whole. The program’s pacing rounds out its presentation. Being that it comes in at nearly an hour-long the program has a lot of ground to cover. And thankfully it never moves too fast in the attempt to cover not only Franklin’s own doomed mission but also the modern day search to find one of the ships that took part in that journey. All three elements play their own important part in the whole of this episode of NOVA. Collectively they show clearly why NOVA is the single-best science-based series on television today and why PBS remains the last bastion of truly worthwhile programming on television today. 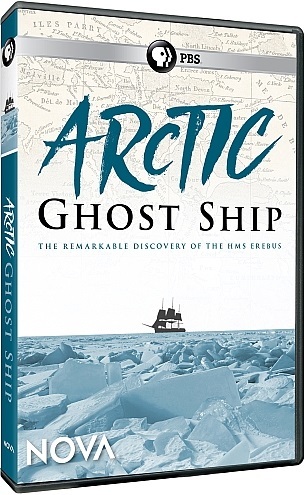 NOVA: Arctic Ghost Ship is yet another example of why the long-running science-based series is the best of its kind on television today. The main reason for this is the very story presented in this episode. While the story of Sir John Franklin’s doomed voyage through the Northwest Passage is relatively well-known, it is not a story that is widely taught in America’s classrooms at any level. More than likely that is the case because it might be considered a specialized piece of history rather than one of the world’s bigger events. But the reality of the situation is that it is just as important to learn about as Magellan circling the globe or Columbus proving the world isn’t flat. That is because Franklin’s journey was one of the earliest attempts by humans to enter and travel through what was at the time one of the world’s most inhospitable and treacherous regions. If not for the attempt on the part of Franklin and his men, Roald Amundsen might not have made his attempt nearly sixty years later; An attempt that luckily for him and his men proved successful, although it took three years to complete. This is all just one part of the story that makes this episode of NOVA so important. It also presents the search for the Erebus, one of the ships that Franklin took on his voyage and why the search was so important not just for maritime history but for history in whole. Finding it meant finally getting some answers as to the fate of at least part of the mission. With all of this in mind, it should be clear why the story at the heart of NOVA: Arctic Ghost Ship is such an important part of the episode’s whole if not the most important part of the episode. The story that lies at the center of NOVA: Arctic Ghost Ship is an obviously important part of the episode’s overall presentation if not the most important part of that whole. While it is unquestionably important to the overall presentation, it is not the only important part of the episode’s presentation now that it is available on DVD. The manner in which the episode is presented is just as important as the episode’s story. The manner in which the episode was presented refers mainly to its format. Much like so many other episodes of NOVA before it, this episode mixes actual footage of the search for the Erebus with re-enactments of Franklin’s doomed journey. Speaking of the re-enactments, they are used sparingly throughout the course of the episode. In simpler terms, they are used more as a tool to help illustrate the story and advance it with the actors taking part in the re-enactments handling their parts with the utmost professionalism. Even in the case of the modern day search for the Erebus viewers are given a fly-on-the-wall perspective in many cases alongside interviews with scientists that expertly explain the importance of the search. They handle their interviews with just as much professionalism as the actors involved in the episode’s re-enactments. Believe it or not, there are some professionals on other similar shows that don’t handle their interviews quite as well or as professionally. Of course most of those cases apply to shows on cable networks. So that says plenty. The balance of the re-enactments and the research segments is just enough to keep viewers engaged from beginning to end. And in doing so the program illustrates just as well why the story at the heart of the episode is so important, too. It is one more way in which the manner in which the episode was presented proves its importance to the whole of NOVA: Arctic Ghost Ship. The story at the center of NOVA: Arctic Ghost Ship and the manner in which the episode was presented (its overall structure) are both key elements in the whole of the episode’s presentation. While both elements are unquestionably important in their own right to that presentation they are not the episode’s only notable elements. The program’s pacing is just as important to its presentation as its structure and the story at its heart. There is a lot of ground to cover over the course of the episode’s near hour-long run time between the actual story of Franklin’s failed journey and the search for the Erebus. Thankfully for those behind the episode, viewers will never feel confused by any of the presented material. That is thanks to pacing that spends just enough time on each as the program jumps back and forth in time, offering solid transitions along the way that help maintain the story’s pacing. It doesn’t just jump from point to point or speed through any given part of the overall story either. The end result is a story that ensures viewers’ engagement and in turn appreciation for its importance in the grand scheme of the world’s history. Realizing and appreciating that importance, audiences will look back on this episode of NOVA and agree that its pacing is just as important to its presentation as the program’s structure and its central story. They will agree that together, all three elements make this episode yet another example of why NOVA remains the best science-based series on television today and why PBS in whole remains the last bastion of truly worthwhile programming on television today. It’s time once again, everybody. The holiday season is officially upon us. And that means that it is time once again for the annual Phil’s Picks holiday giveaway. Each Friday in December I will be giving away a prize to one lucky reader from the list below. Here’s the catch: YOU the reader get to choose the prize instead of me. I’m going to sweeten the deal for you, the loyal Phil’s Picks fans this year, too. I am going to bundle together the standalone season sets of Hey Dude, and The Wild Thornberrys. This is just the current list. There’s a chance I could throw in even more prizes as the month goes on. So if you want a chance to win a prize for yourself or someone you know, make sure that you get your name in now! Good luck and spread the word! As 2015 begins to wind down, most people are beginning to turn their thoughts to 2016. For those that might not have known, 2016 is a big year in the history of television. That is because it will mark the fiftieth anniversary of one of television’s most iconic series. The series in question is none other than Star Trek: The Original Series. While its original run on NBC lasted only three seasons, it has proven in the years since to be one of television’s most beloved and important series. Since it ended its run in 1969, no fewer than four other series have come and gone along with a number of big screen features and box sets containing each series. This includes box sets containing all three of the original series’ seasons. The original series has been released in its own standalone sets on both DVD and Blu-ray and a full series set on Blu-ray. Interestingly enough for all of its various releases Star Trek: The Original Series has never gotten a full series run on DVD. That is until now. 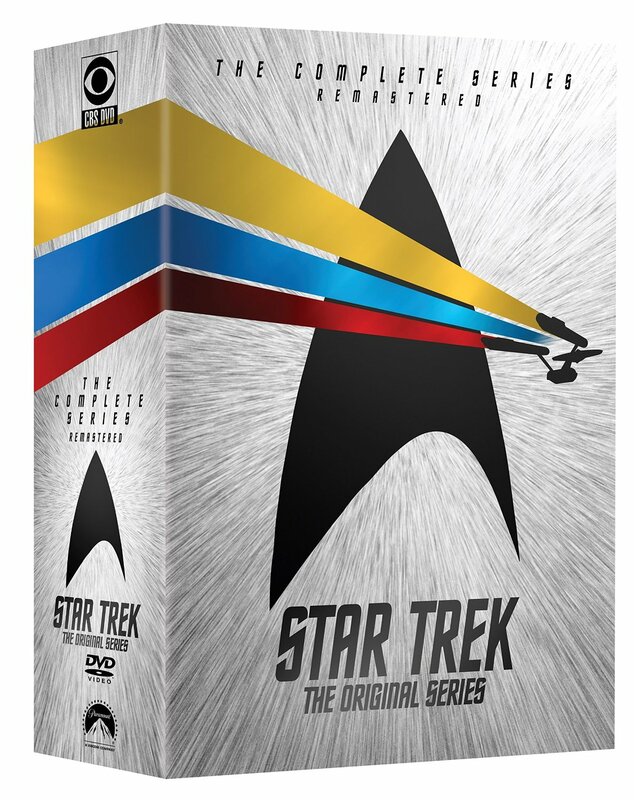 Paramount Studios Home Entertainment released Star Trek: The Original Series–The Complete Series on DVD for the first time ever on Tuesday, November 3rd. In examining this first-time release it can be said that there is so much to say to its benefit that it is one of the best of this year’s new box sets for grownups if not the year’s best. The main reason for that is the very presentation of the episodes in their setting here. That will be discussed in more depth shortly. Moving on, another reason that the box set proves so enjoyable is its bonus material. There are trailers, commentaries, retrospectives and so much more added to the set from its first disc to its last (for the record, the series’ seventy-nine episodes and bonus material are spread across a total of twenty-fix discs in this box set) for more than seven hours of extra entertainment and insight for audiences. Last but hardly least worth noting in this brand news DVD box set’s positives is the combined work of the series’ writers and cast. The adventures crafted by the series’ writers were (and are) more than enough reason in themselves for any fan to purchase this box set. The cast’s interpretation of the episodes’ scripts rounds out the presentation of Star Trek: The Original Series–The Complete Series. Each element in and of itself plays its ow important part in the overal presentation of Star trek’s new full series run on DVD. Together they make Star Trek: The Original Series–The Complete Series a must have for almost any Star Trek fan and one of the best of this year’s new box sets for grownups. Star Trek: The Original Series–The Complete Series is one of the best of this year’s new box sets for grownups. It is a collection that those without any of the series’ previous releases on DVD and Blu-ray will especially appreciate. That is thanks in large part to its very presentation. All three seasons of Star Trek: TOS (as it will be referred to from here on out) have been previously released in their own standalone season sets both on DVD and Blu-ray. The series has even received its own full-series set on Blu-ray as recently as 2009. For all of these releases, the groundbreaking sci-fi series has never received a full series release on DVD until now. All seventy-nine of the series’ original episodes are included in this set. The twenty-five disc (yes, twenty-five discs) is just as impressive because of its price. It retails between forty and forty-five dollars. Considering the ratio of the number of episodes to discs and the amount of bonus material that is actually not that bad of a price. That is especially the case considering that the show’s full series Blu-ray box set retails for nearly double that depending on the retailer. It proves the DVD box set to be relatively affordable. What’s more, the episodes look and sound quite impressive from one to the next. It is even obvious where the episodes have in fact been re-mastered just as is advertised on the set’s outer box. That is even discussed in one of the set’s bonus features, which will be discussed later. Getting back on the subject at hand, the only major downside to the overall presentation of the series here lies in its packaging. Unlike most multi-disc sets released today, the discs are packaged in what would now be considered something of an unconventional fashion. They are placed two to a side on each of the set’s plastic inserts with the discs overlapping one another. This is not the best idea when it comes to packaging. But considering that the set is spread across twenty-five total discs, it is something of a necessary evil. Had the discs been placed one to a side as is the case with most multi-disc sets, it would have potentially taken up twice the space and required even more space for the discs. To that extent Paramount’s home entertainment division can be forgiven for the set’s packaging. All things considered here Star Trek: TOS–The Complete Series‘ packaging proves that while it is not perfect, it is still be a solid positive to the set’s overall presentation. The presentation of its episodes on the other hand is wholly positive. The end result of both elements together creates a presentation that every Star Trek fan will appreciate. The packaging of Star Trek TOS–The Complete Series, while not perfect, is a necessary evil. It allows all twenty-five of the set’s discs to be housed in a single box rather than forcing them to be spread across multiple boxes. The presentation of the episodes across each of those discs is in itself quite impressive to say the least. Together they make up just one part of what makes Star Trek: TOS–The Complete Series an impressive new release for this classic series. The bonus material included throughout each of the series’ twenty-five discs adds even more enjoyment to the series in whole. There is an ongoing series of featurettes titled “To Boldly Go” that spans all three seasons. This series of featurettes examines the series and its impact on both television and American culture in whole. If that isn’t enough for audiences, Season One includes a bonus featurette titled “Spacelift: Transporting Trek Into The 21st Century.” This leading bonus examines the work that went into re-mastering the series in terms of its special effects. Those special effects include the look of the Enterprise against different planets, interior shots of the Enterprise, and other elements including the work done to re-master the Enterprise for the special inclusion of the Star Trek: DSN episode “Trials and Tribble-ations.” Speaking of that episode, it is included, too, in whole as a companion piece to the famed TOS episode “The Trouble With Tribbles.” There is even a complete episode of Star Trek: The Animated Series titled “More Tribbles, More Troubles” included as its own companion bonus to the TOS episode. There’s also a bonus in which the cast of TOS discusses the many romances that took place throughout TOS. This includes not only Captain Kirk’s own various romances but those enjoyed by other members of the cast including a rumored romance between Spock and Uhura. And even that bonus isn’t the end of the set’s extensive bonus material. There are discussions by the cast on a number of different topics throughout the set that will entertain audiences for hours if not days. That vast collection of bonuses set against the presentation of the series’ episodes here and its packaging makes Star Trek: TOS–The Original Series that much more entertaining for audiences and that much more of a must have for any Star Trek fan. The bonus material included in Paramount and CBS DVD’s new re-issue of Star Trek: TOS–The Complete Series couples with the presentation of the series’ episodes and its packaging to make it one of the best of this year’s crop of new re-issues. As important as all of the noted elements are to the whole of this massive box set, they are not the set’s only important elements. The cast’s interpretation of the scripts rounds out the whole of this presentation. William Shatner has been spoofed countless times over ever since Star Trek: TOS went off the air for his portrayal of Captain Kirk. Yet for all of the jabs that have been taken at him over the years, there is no denying his work on camera. No, there will be no dumb puns here. The fact of the matter is that Shatner was (and is even today)wholly believable as the head of the Federation’s flagship starship. Sure, he gets a little cheesy in his interactions with all his various female co-stars. But in general his firmness as he leads the crew through some very tough situations makes suspension of disbelief quite easy. Leonard Nimoy and DeForest Kelley are both just as impressive as Spock and Bones respectively. Whether on their own or together with one another (and with Shatner) both men hold their own throughout every episode. From handling serious moments to more light-hearted, comical moments all three men are a joy to watch. That is not to ignore any of the show’s other main cast members either. Nichelle Nicols, James Doohan, Walter Koenig, and George Takei are equally enjoyable to watch when they get their time in the spotlight. Whether for their work, for that of the series’ main cast, or any of the supporting and guest cast, it can be said that the work of the series’ cast plays its own important part in the whole of Star Trek: TOS. Together with the work of the show’s writers and the overall presentation of the episodes in this new DVD box set, all the noted elements make this collection a must have for any Star Trek fan. Those elements coupled with the set’s packaging and companion bonus material, the set in whole proves to be one of the best of this year’s crop of new re-issues. Eric Clapton celebrated a big milestone earlier this year. The legendary guitarist celebrated his 70th birthday. And he didn’t just celebrate it with a quiet night at home. Instead he celebrated it in front of hundreds of fans at the famed Royal Albert Hall. Now fans around the world will get to take in that celebration in the comfort of their own homes this fall courtesy of the people at Eagle Rock Entertainment in the form of the new recording Slow Hand at 70: Live at the Royal Albert Hall. Slow Hand at 70: Live at the Royal Albert Hall was released earlier this month in a variety of platforms including DVD + 2CD, Blu-ray + 2CD, and an exclusive Deluxe DVD + 2CD edition. For the sake of this review, the attention will rest on the recording’s DVD + 2CD platform. There is plenty to like about this recording beginning with the show’s set list. While not necessarily a career-spanning show or even a career-defining set list it still touches on some of Clapton’s biggest hits. It is just one part of what makes this presentation another impressive addition to Eagle Rock Entertainment’s expansive catalogue and to any Clapton fan’s music library. Clapton’s stage presence and that of his fellow performers is just as important to the whole of this recording as the show’s set list. The concert’s production values round out its presentation. Between the work of the concert’s audio engineers, those behind the cameras, and those that handled the concert’s post-production the production values stand out here just as much as any of the other live recordings in Eagle Rock Entertainment’s vast library of archived concerts. Of course the package’s double gate-fold packaging can’t be ignored either. Together with all of the previously noted elements the DVD + 2CD presentation of Eric Clapton’s Slow Hand at 70: Live at the Royal Albert Hall proves to be yet more proof of why Eagle Rock Entertainment remains today the leading name in live recordings and why this recording in itself is one more of the best of this year’s new live recordings. Eric Clapton’s new live recording Slow Hand at 70: Live at the Royal Albert Hall is one more of the best of this year’s new live recordings. Being such an impressive recording it is also more proof (as if the company needed it) as to why Eagle Rock Entertainment remains today the leading name in live recordings. The main way in which it shows itself to be such an impressive recording is its set list. The seventeen-song set list comes in at just under two hours. Specifically it comes in at an hour and forty-five minutes. Though the bonus performance of ‘Little Queen of Spades’ pushes that time to just over two hours. While not necessarily a career-spanning or even career-defining set list it is still a set that every fan will enjoy. It includes some of Clapton’s biggest hits of all time including: ‘Key to the Highway,’ ‘Wonderful Tonight,’ ‘Cocaine,’ and ‘I Shot The Sheriff’ among others. There is also a great performance of Willie Dixon’s blues classic ‘Hocchie Coochie Man’ and ‘You Are So Beautiful,’ which was co-written by Billy Preston, Bruce Fisher, and Beach Boys legend Dennis Wilson. As if all of that is not enough, the classic ‘Tears in Heaven’ is here, too as are ‘Layla,’ ‘Somebody’s Knockin’ On My Door’ and ‘Driftin’ Blues,’ which was originally composed by Johnny Moore’s Three Blazers in 1945. Between these songs and those not noted here, it can be said that the set in whole plays its own important role in the whole of this concert recording’s overall presentation. It is not the only part of the presentation’s whole that makes it enjoyable. Clapton’s stage presence and that of his fellow performers is just as important to the recording’s presentation as the show’s set list. The set list that is featured in Eric Clapton’s new live recording is an important part of the recording’s whole in its own right. That is because it presents just a handful of the veteran musician’s songs from his extensive catalogue of songs. It might not necessarily be a career-defining set list or even career-spanning in the traditional sense of the terms. But it is still an impressive collection of songs nonetheless. As impressive as the show’s set list proves to be it is just one part of the presentation that makes it such an enjoyable program. Clapton’s stage presence and that of his fellow performers is just as important to note as the concert’s set list. There are no fireworks or big, bombastic guitar solos here. It is just a straight forward performance in which Clapton and company really let the music do the talking for them. One of the most notable moments to note in regards to the group’s stage presence is Clapton’s performance of ‘Tears in Heaven.’ Typically a slow, emotional piece Clapton opts for a different take in his performance here. He actually speeds up the song here. And while that might not seem like much on the surface, it is quite important to note. That is because it gives the song a wholly different identity from its original recording. ‘I Shot The Sheriff’ gets the audience just as into the show thanks to the group’s grooving energy as it performs the song. And the group’s take on ‘Hoochie Coochie Man’ conjures thoughts of a smoky old jazz club even with it being performed in what is one of the biggest and most respected concert halls in England if not the UK. The energy exuded through this performance and that of each of the concert’s other songs shows in whole just why Clapton’s stage presence and that of his fellow performers is so important to the whole of the performance. All involved handle each song with such expertise that it makes the music just as much the star of the show as its performers; So much so that there is really no need for interaction between Clapton and the audience in attendance. All things considered here Clapton’s stage presence and that of his fellow performers throughout each of the show’s songs shows just why it is just as important to the whole of the recording as the show’s set list. The set list featured in Slow Hand at 70: Live at the Royal Albert Hall and the band’s stage presence throughout the featured songs are both key ways in which the recording shows itself to be yet another solid release from Eagle Rock Entertainment and a recording that any of the legendary guitarist’s fans should have in their own music libraries. While both elements are of equal importance to the concert’s overall presentation they are not the only elements that should be considered. The concert’s production values are just as important to the concert as its set list and the performers’ stage presence. The Royal Albert Hall is a massive venue to say the very least. For those that might not be familiar with the hall’s makeup it is a very large, open structure. That means that the sound absolutely envelopes the hall. It also means plenty of options for camera shots. And the camera crew utilizes every option, too. There are multiple angles captured on-stage as well as from the audience. The on-stage angles include head-on shots of Clapton working his way through each song, his backup singers, Michelle John and Sharon White, singing like two wonderful angels, and even bassist Nathan East when he gets his time in the spotlight. There is also a number of equally wonderful other angles from every possible post on stage that heighten the viewing experience even more for audiences at home. The audience shots are just as incredible. There are incredible shots from atop the hall in its highest balconies and other trucking shots from the hall floor. Both shots capture in their own way the very immensity of the hall’s structure. Together they not only capture its incredible size but also the equally immense size of the audience in attendance. It shows Clapton’s continued popularity and relevance among audiences even decades after his debut. Considering the hall’s size, the audio is just as impressive. Audiences get to hear just how full the sound is as it rings through the hall. Yet thanks to those behind the audio boards (and those that handled the audio in post production) it never feels overpowering either to audiences or itself at any point. One can only imagine how it must have sounded in person. And even considering that it sounded just as incredible in this recording if not better. Coupled with the equally standout work of the show’s camera crew (and those that edited the concert in post) the concert’s production values show in the end exactly why they are just as important to this recording as the show’s set list and the performers’ stage presence. The combination of all three elements in the concert’s DVD + 2CD combo pack makes it just as enjoyable as it is in any of its other presentations. Given there is quite a bit more in the extended deluxe edition for true fans of Eric Clapton. But it doesn’t detract from the enjoyment offered by this presentation one bit. It is just as enjoyable in its own right. The double gate-fold packaging can even be cited in the package’s presentation. It may be more bulky than packages that use those plastic inserts in order to save space. But it also ensures the safety of the package’s discs. 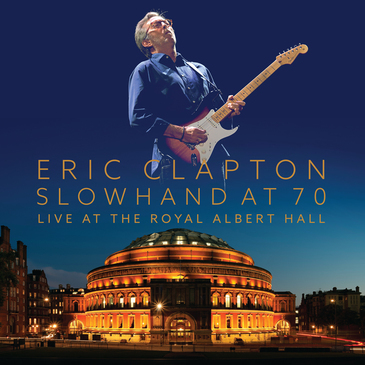 Set against the other noted elements, they collectively show exactly why Slowhand at 70: Live at the Royal Albert Hall is one more of this year’s best new live recordings and why Eagle Rock Entertainment remains today the leading name in live recordings. Science fiction has a very rich history in television’s annals. Looking back through the medium’s rich history, it is easy to find any number of series that have left their mark on that history. Those series include the likes of Lost in Space, Voyage to the Bottom of the Sea, Star Trek, and so many others. While there are plenty of important, influential sci-fi series that have come and gone over the decades, there are just as many that sadly have come and gone without so much as a glance. Some of those series deserved to be cut short. Others, such as ABC’s short-lived series Automan, never really got the chance that they rightly deserved for one reason or another. Automan never really got a fighting chance because at the time of its original broadcast (1983 – 1984) there was little to nothing on television like it at the time. This includes other sci-fi series. It was at its core a series about an artificial intelligence that was also something of a superhero. On another level, it was also a buddy comedy of sorts. It only lasted for a total of thirteen episodes, though only twelve of those thirteen episodes ever actually made it to air. That is until recently. Thanks to the people at Shout! Factory and Fabulous Films, Automan has finally been given a new life in the four-disc DVD box set Automan: The Complete Series. Whether or not audiences are familiar with the short-lived series, they will agree in watching it that it was a series well ahead of its time and that this new box set is a welcome return for the series. The show’s writing (including its stories, character development, and dialogue) shows this. The work of the show’s cast is just as important to note of its overall presentation. Last but hardly least of note that makes this set worth the watch among sci-fi fans is its bonus material. All three elements are equally important to the whole of Automan: The Complete Series’ presentation. Altogether they make this series set one that every sci-fi fan will want to see and should see at least once if not more. Automan is one of the most underrated and under-appreciated sci-fi series in the genre’s rich history on television. It only lasted a total of twelve episodes in its run from December 1983 to April 1984. Looking at other series (including other sci-fi series) on television at the time, there was little if anything like it on television at the time. So it is safe to say that it was ahead of its time. That is likely why it was cut short in its initial run. Thanks to Shout! Factory and Fabulous Films, though it has now been introduced to a whole new generation of audiences in the new box set Automan: The Complete Series. And those audiences that give this series a chance will find that there is plenty to like about it beginning with its writing. The writing behind Automan is the core of its presentation. This includes not only the stories that were crafted for the series but also the show’s dialogue and it character development. The episodes are, in all fairness, standard fare. The series premiere sees Walter and Automan globe hopping to stop an international crime ring and solve a kidnapping case in the process. Later in the series’ run Walter and Automan have to clear one of Walter’s partners in “Flashes and Ashes.” There is also a murder mystery to be solved in “Murder, Take One” when a former movie star is suspected of killing a gossip columnist. A crooked studio head is involved in the mystery, too. There’s even a standard story in which Walter and Automan have to stop a counterfeiter in “The Great Pretender.” These are just a few of the episodes that are featured through the course of the series. While they are standard fare that doesn’t take anything away from any of them or those not noted here. As a matter of fact the execution of each episode will keep viewers of any age fully engaged. There’s just a certain camp about the writing that is entirely 80s. And it makes each episode so fun. It’s just one aspect of the show’s writing that makes the writing stand out, too. The dialogue that is incorporated into each of the series’ episodes is just as worth noting as the stories. The stories that were crafted for Automan are in themselves a collective prime example of the importance of the series’ writing. While the stories are by and large standard fare, there is still a certain campiness about the stories that makes them and their execution engaging and entertaining all at once. As important of an element as that is within the bigger picture of the series’ writing, it is just one part of the writing that makes the writing in whole so important to the series. The dialogue that is incorporated into each episode is just as important to note as the stories themselves. That is especially the case with Walter and Automan. Automan’s innocent defiance of Walter even as an artificial intelligence makes for plenty of laughs throughout the series. He happily declares in one episode that Walter is basically level-headed and would understand him going out even thought he was told to not go out. It’s not the only time that he makes such a declaration either. Walter’s surprised reactions to Automan’s abilities early on are even more example of the dialogue’s place in the show’s writing. Perhaps most interesting of the dialogue that is used in this show is that for all of his superhuman abilities and knowledge the writers never have him use any of the standard, pompous lines that were far too common among action heroes on TV and film in that era. Rather, he comes across more like Data, from Star Trek: The Next Generation with his constant curiosity and straight forward demeanor. It is just one more way in which the show’s dialogue proves to be just as important to the show’s writing as the stories themselves. And it is not the last example of the writing’s importance. The character development within the series is just as important to note as the stories and the show’s dialogue. The stories that were crafted for Automan and the show’s dialogue are both important parts of the show’s writing in their own way. As important as both elements are to the whole of the writing they are only part of what makes the writing so important to the series. The character development within the series is just as important as the writing and dialogue. Audiences will note that as the series progresses, Walter actually becomes more welcoming of Automan taking part in the cases that he is working. There is also a growing friendship between the pair that becomes increasingly obvious in each episode. It starts off as an odd couple friendship. But then grows to become a real friendship that is centered not only on their pair’s drive to solve crimes but in their own differences. Audiences will love seeing Walter play both the straight man and the comic relief in one while Automan is the innocent yet still confident figure. The juxtaposition of the two totally different personality types makes for plenty of entertainment in each episode. Together with the dialogue incorporated into the show and the work put into crafting each episode’s story the character development within each script rounds out the ways in which the series’ writing displays its importance to the whole of the show. Of course the writing behind Automan is just one part of what makes the series well worth the watch by any sci-fi fan in its new DVD release. The work of the show’s cast is just as important to the show as its writing. The writing that went into Automan clearly shows in each of its separate elements exactly why it is so important to the show. From each episode’s story to the dialogue within each episode to the very development of the characters (specifically Walter and Automan) the writing proves quite integral to the series. Of course the work of the show’s cast in interpreting the writers’ scripts is just as important to the series as the writing itself. Both Desi Arnaz, Jr. and co-star Chuck Wagner impress in their interpretations of the show’s scripts. Being a superhuman figure of sorts, it would have been so easy for Wagner to put on more of an air of superiority to Arnaz’s Walter. Yet he doesn’t go that route at any point. Rather, he takes the knowledge of Automan’s superiority and instead gives him a sense of humility and almost alien interest in everything. Yet he does still maintain a certain sense of confidence throughout each episode. That mix of confidence and innocent curiosity about the human world makes Wagner’s portrayal perfect with each episode. And when set against Arnaz the two make a pair that is so sorely missing from today’s television offerings. Speaking of Arnaz, he is just as entertaining as Walter Nebicher. His portrayal of the high-strung cop makes for plenty of laughs especially as Walter tries to keep Automan’s identity secret in so many different situations. That nervous energy set against Automan’s cooler, more collected demeanor is a wonderful juxtaposition of personalities. That applies both as the duo tries to solve the given cases and even when just the two are together on screen in general scenes. Taking all of this into consideration it can be said even more so that Arnaz and Wagner’s work in interpreting the series’ scripts is just as important to its presentation as the scripts. OF course even that is still not the do all end all for this first-time release. The bonus material that is included within the box set rounds out the box’s presentation. The writing and acting behind Automan collectively does quite a bit in showing why this classic sci-fi action series was so far ahead of its time in its original run. As important as both elements are to the show, they are not all that makes it worth the watch in its new DVD box set release. The bonus material that is included in the set is just as important to its presentation as those noted elements. The standard cast and crew bios are there as are other little extras. 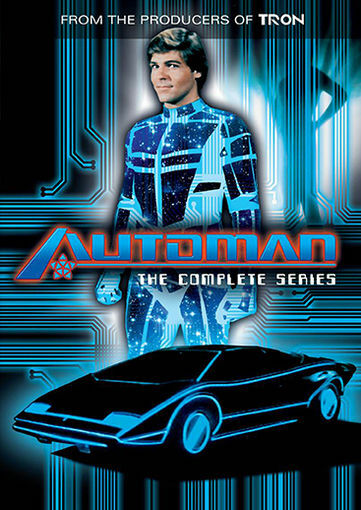 At the heart of the bonus content is the near hour-long documentary “Calling Automan – The Auto Feature.” Audiences learn through the forty-two minute documentary plenty of interesting tidbits about the series. Most notably audiences learn that it might not have been ratings that doomed the show but the costs to produce the show. There is also an interesting little piece about star Chuck Wagner’s professional training in musical comedy and its influence in some of the bits incorporated into the show. And Wagner even admits that in auditioning for the part of Automan, he was worried he wouldn’t get it because of the other men auditioning for the role. Wagner explains how the look of the other candidates made him wonder if he had a chance at the role. As if that isn’t enough for audiences, Wagner and Arnaz jokingly discuss the car that Automan used in the show and how little the pair actually used it because it was such an exotic car. The duo reveals that most of the car scenes were actually shot with the pair in a scaled up model of the car’s interior on a sound stage. These are just a few of the items covered in “Calling Automan – The Auto Feature.” There is far more for audiences to discover for themselves over the course of the behind-the-scenes featurette. Those other extras combined with everything noted here shows in whole why “Calling Automan – The Auto Feature” is so important to the whole of Automan: The Complete Series. Those revelations add even more depth to the stories presented in each of the series’ episodes and to the show’s writing in whole. It adds just as much appreciation for the work of the series’ cast, too. All things considered Automan: The Complete Series’ shows in whole to be one of the most surprisingly enjoyable sci-fi series sets to be released this year. It proves to be one that actually deserves a reboot and unless or until that happens, one that every sci-fi fan should have in his or her own home DVD library. The end of the year is nearly here. That means one thing. Okay, that means lots of things. But for those in the entertainment world (this critic included), it means one thing. That one thing is establishing those annual year-ender lists. Needles to say most of this critic’s lists are done and revealed soon. However, there are some lists that are not yet done. The list for the year’s best new hard rock and metal albums is one of those few left that has yet to be completed. But that is only because there are so many albums from which to choose . There are more great albums than spaces, plain and simple. And just recently yet another of that mass of options was released when veteran hard rock band Sevendust released its latest album Kill The Flaw. From beginning to end, this album proves to be one of the band’s best albums to date. It boasts the band’s trademark meloddic hard rock sound without compromising quality at any given point. That is evident in the album’s opener/lead single ‘Thank You.’ This song was a great choice with which to open KTF (as it will henceforth be called here) both on record and as the album’s lead single. The full reason will be discussed at more length shortly. It is just one example of what makes this latest album (the band’s eleventh full-length studio recording) such a solid return for the veteran Atlanta, Georgia-based band. ‘Silly Beast,’ comes late in the album’s near fifty-minute run time. It is another example of the album’s strength. Its musical content takes listeners back to the band’s 1997 self-titled debut to a point while the lyrics prove to be just as searing as those in this album’s opener. This song is one of the album’s most interesting moments thanks to the mix of its musical and lyrical content. Its musical content harkens back to the days of Animosity while its lyrical content presents its own introspective, thought-provoking message. Last but hardly least of note in this album’s high points is the single ‘Not Today.’ This song is another work that pulls directly from the band’s previous releases at least musically. With its heavy guitars and powerhouse vocal delivery from front man Lajon Witherspoon, it proves to be yet another of the album’s high points. All three songs show in their own way just what makes KTF a solid return for Sevendust. And together with the remaining eight tracks not noted here, all eleven tracks show in whole why this album is in whole one more of the year’s best new hard rock and metal albums. 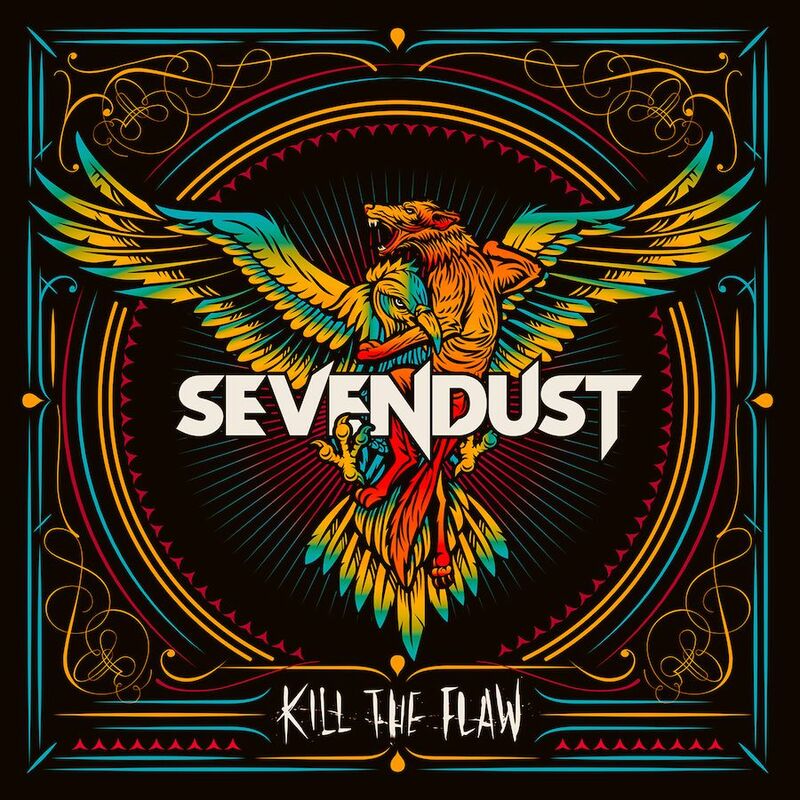 Sevendust’s eleventh full length studio recording is one of the best of this year’s crop of new hard rock and metal albums. That is clear right from the searing first moments of the album’s opener/lead single ‘Thank You.’ Thanks to the mix of its solid musical content and its indictment of an unnamed figure that has made someone else’s life miserable, it proves to b a song to which every listener will be able to relate. Front man Lajon Witherspoon sings of said individual, “You are the beginning and end to all of this.” He goes on to say to this same individual in the song’s chorus sarcastically, “Thanks for coming around/And pushing my head back to the ground/Thank you for slowing me down/I need to fall back and start it over.” He comes across as saying to said person that he/she has done nothing good for the song’s subject, but ironically has also in turn served as the driving force behind that person striving for something better. That can be argued as Witherspoon sings, “Been holding on so long/Denying what I’ve done/I destroyed myself but I wish you well/The beginning and end to all of this.” Again, there seems to be something of a sense of sarcasm and irony in his delivery. That argument is illustrated even more thanks to the song’s musical content. The tone of the song’s musical content just seems to echo its musical content with its power and the tone. Both elements considered together, they make ‘Thank You’ a song that will have listeners saying thank you to the band for including it in its new album. That is because that mix of musical and lyrical content is sure to provide some emotional strength to any listener that has ever dealt with a situation (or person) such as that depicted here. With all of its power, it is just one example of what makes KTF a welcome, solid return for Sevendust. ‘Silly Beast’ comes later in the album’s run. It is yet another example of the album’s strength. KTF’s opener/lead single ‘Thank You’ makes clear through the combination of its musical content and searing lyrical content to be a solid opener and first impression from the band in its new album. It is just one example of what makes KTF such a solid return for the band. Later in the album’s run another song is presented that exhibits that strength just as much as ‘Thank You.’ The song in question is ‘Silly Beast.’ Musically speaking, it takes long-time listeners back to the days of the band’s 1997 self-titled debut album thanks in large part to the heavy, crunching, dual guitar attack of Clint Lowery and John Connolly. Drummer Morgan Rose adds even more to that feeling with his work behind the drum kit. While the song’s musical content will definitely put a smile on listeners’ faces, the song’s deep, introspective lyrical content is just as certain to impress listeners and generate its own share of discussions. As Witherspoon sings here, “For all the seasons you have lost/You beg for time/You waste the words (Just let it go)/And on your dying you hold the line/Forget the world/You’re on your own.” The picture painted here comes across at least to this critic as an indictment of a self-defeatist sort of individual. This can be argued just as much as Witherspoon goes on to sing in the song’s chorus, “Beneath this wonderful lie you mastered/You find a dark place/To throw away all the light like a coward/Your miracle’s a lie to us all.” Witherspoon comes across here as saying to the unnamed figure, that everything people see of said figure is a lie. In reality, said figure is just a self-hating type that wants to bring the world down with him/her. The frustration exuded through these lyrics (and Witherspoon’s delivery of said lyrical content) is heightened even more through the song’s musical content. Both elements considered together, they make clear why ‘Silly Beast’ is one more of KTF’s highest points. It is another one of those works to which so many audiences can relate as everyone has dealt with someone such as the figure depicted in this song. Even with that ability to relate to listeners and entertain them at the same time, it is not the only remaining example of this record’s strength. ‘Thank You’ and ‘Silly Beast’ are both clear examples of KTF’s strength. Of course they are hardly the only songs featured in this album that exemplify its strength. ‘Not Today’ is another of the album’s highest points. The song’s heavy guitars set against Witherspoon’s equally powerhouse vocal delivery make the song’s musical content more than enough reason to check out this song. The song’s lyrical content makes even more reason for listeners to hear this song, which is another of the album’s singles. Witherspoon sings here, “This is the thing that swallows you whole/Don’t give away what you wanted so long/There’s no more words/No more reasons/Not one more lie you can feed us/Oh you know all the things we loathe/We become it/I defeated it/We will become this.” He goes on to sing, “Resist/You bite your tongue and stay asleep/That’s all the dirt that we need/The guilty pleasure you came for fed your disease/It don’t stick/The lines/are blurred and grey/Go on and try to kill love/And that’s your last mistake/Is that the thanks we get/Yeah, that’s the thanks we get.” It is only this critic’s interpretation, but these lines come across as Witherspoon saying to an unnamed figure that the very thing that said figure tries to pretend doesn’t exist and it is destroying said person. This could very well be completely off the path. But again it is only the interpretation of this critic. Regardless of right or wrong, the very fact that the song’s lyrical content could generate its own share of interest and discussion proves even more why this song is one of KTF’s most notable works. Together with the likes of ‘Thank You’ and ‘Silly Beast’ all three songs show together just how solid and strong KTF is. That is not to ignore any of the album’s other unnoted compositions. The fact of the matter is that all eleven tracks considered together, they make KTF one more of this year’s best new hard rock and metal albums.